Liverpool boss Rafael Benitez believes his side's away goal could be the key to deciding their quarter-final Champions League tie with Arsenal. 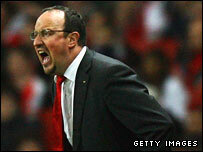 "We are in a good position," said Benitez after his side clinched a 1-1 draw in the first leg at The Emirates. "It was really important for us to score so fast," he added, referring to Dirk Kuyt's equaliser only three minutes after Emmanuel Adebayor scored. "The away goal is always important in the Champions League." Arsenal boss Arsene Wenger was unhappy his side were not awarded a second-half penalty when Kuyt appeared to foul Alexander Hleb but Benitez backed Dutch referee Peter Vink's decision. Arsenal will score at Anfield but I think as usual we will concede...penalties here we come! "I was watching the replay and I don't think it's clear," added Liverpool's Spanish manager. "In England it is not a penalty." And Benitez singled out Dutch striker Kuyt for particular praise. "Kuyt was man-of-the-match - he was always in support," he stated.